An Administrative Assistant Coordinator renders support to the employees, supervises the staff and assists the management in the budgets. 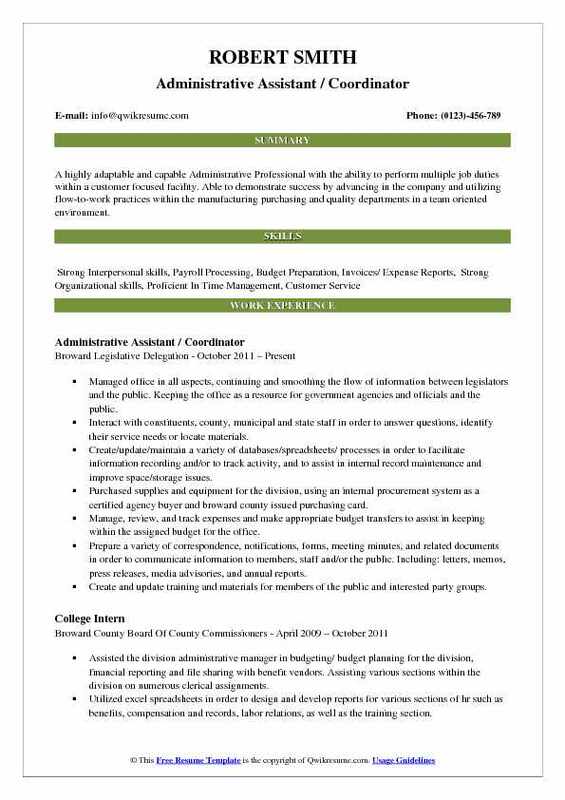 Administrative assistant coordinator acts as a bridge and connects the organization with various vendors, staff members, and departments. They are also responsible to carry out various other duties like – hiring employees, setting work assignments, evaluating current employees, creating a database, drafting letters, securing the maintenance and other general administrative works. Individuals seeking to join as an Administrative Assistant coordinator should be well motivated, meticulous and practical. 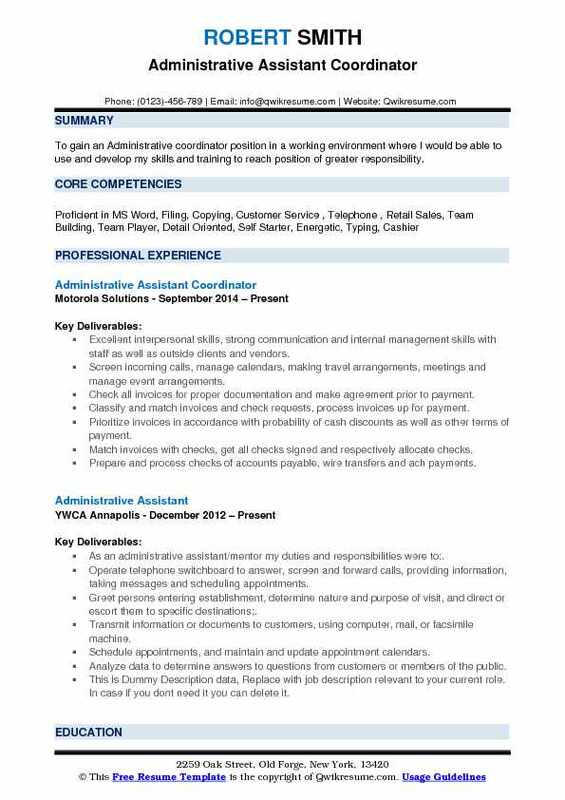 Hiring officers normally look out for the Administrative Assistant Coordinator Resume sample that contains a minimum of High School Diploma for this job post, however, some company prefer a Bachelor’s Degree. 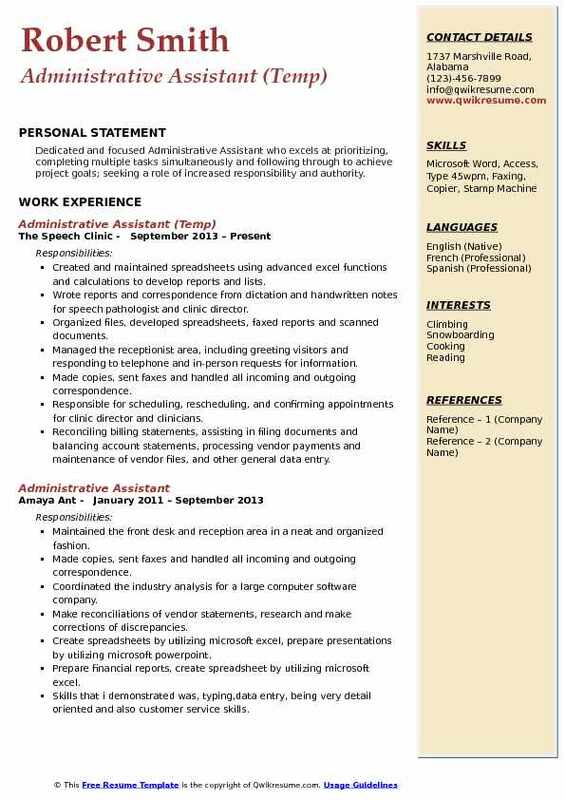 Summary : Wrok as Administrative Assistant with a company that offers internal opportunities for growth and advancement. Willing to take on additional responsibilities and challenges Displays excellent time management with high attention to detail Works effectively as a team member. Scheduled and coordinated meetings, appointments and travel arrangements for managers and the team. Managed expense reports in accordance with regulations and company policy. Ensured outgoing correspondence and reports were finalized in advance of individual deadlines. Prepared all filings and provided administrative support for the political action contribution and lobbying activities of a fortune 500 telecommunications company. Prepared official state reports to be filed quarterly for nj, ny and ct. Kept track of and filed lobbying reports, including official state reports and internal reports. Provided a pac balance sheet each month and kept a calendar of all the deadlines for the pac reports. 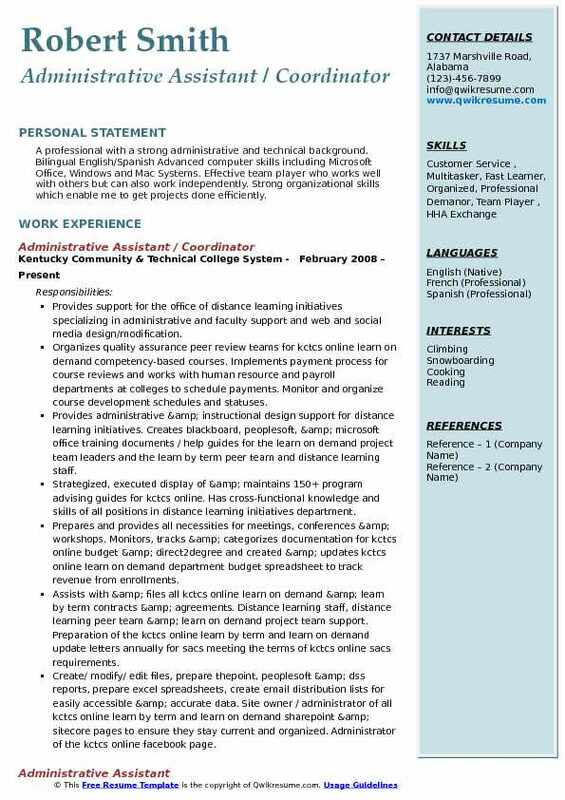 Objective : To gain an Administrative coordinator position in a working environment where I would be able to use and develop my skills and training to reach position of greater responsibility. Excellent interpersonal skills, strong communication and internal management skills with staff as well as outside clients and vendors. Screen incoming calls, manage calendars, making travel arrangements, meetings and manage event arrangements. Check all invoices for proper documentation and make agreement prior to payment. Classify and match invoices and check requests, process invoices up for payment. Prioritize invoices in accordance with probability of cash discounts as well as other terms of payment. Match invoices with checks, get all checks signed and respectively allocate checks. Prepare and process checks of accounts payable, wire transfers and ach payments. Summary : A highly adaptable and capable Administrative Professional with the ability to perform multiple job duties within a customer focused facility. Able to demonstrate success by advancing in the company and utilizing flow-to-work practices within the manufacturing purchasing and quality departments in a team oriented environment. Managed office in all aspects, continuing and smoothing the flow of information between legislators and the public. Keeping the office as a resource for government agencies and officials and the public. Interact with constituents, county, municipal and state staff in order to answer questions, identify their service needs or locate materials. Create/update/maintain a variety of databases/spreadsheets/ processes in order to facilitate information recording and/or to track activity, and to assist in internal record maintenance and improve space/storage issues. Purchased supplies and equipment for the division, using an internal procurement system as a certified agency buyer and broward county issued purchasing card. Manage, review, and track expenses and make appropriate budget transfers to assist in keeping within the assigned budget for the office. Prepare a variety of correspondence, notifications, forms, meeting minutes, and related documents in order to communicate information to members, staff and/or the public. Including: letters, memos, press releases, media advisories, and annual reports. Create and update training and materials for members of the public and interested party groups. 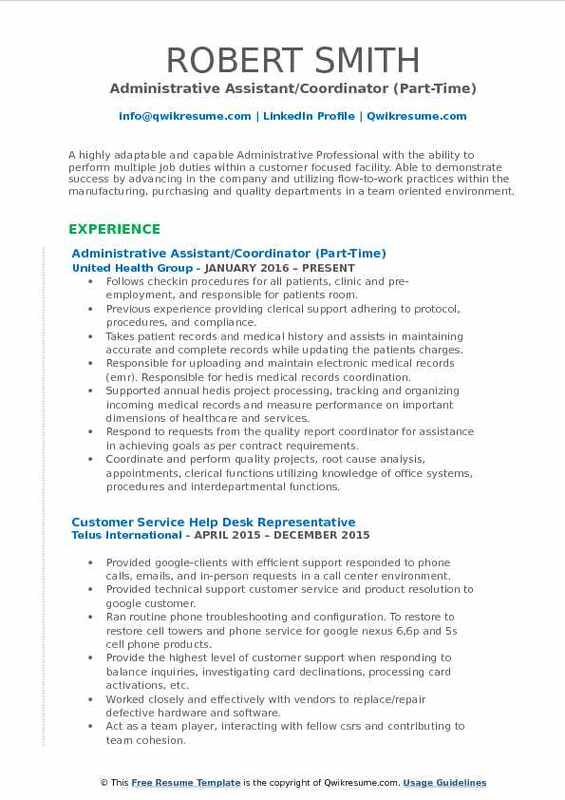 Objective : A highly adaptable and capable Administrative Professional with the ability to perform multiple job duties within a customer focused facility. Able to demonstrate success by advancing in the company and utilizing flow-to-work practices within the manufacturing, purchasing and quality departments in a team oriented environment. Follows checkin procedures for all patients, clinic and pre-employment, and responsible for patients room. Previous experience providing clerical support adhering to protocol, procedures, and compliance. Takes patient records and medical history and assists in maintaining accurate and complete records while updating the patients charges. Responsible for uploading and maintain electronic medical records (emr). Responsible for hedis medical records coordination. Supported annual hedis project processing, tracking and organizing incoming medical records and measure performance on important dimensions of healthcare and services. Respond to requests from the quality report coordinator for assistance in achieving goals as per contract requirements. Coordinate and perform quality projects, root cause analysis, appointments, clerical functions utilizing knowledge of office systems, procedures and interdepartmental functions. 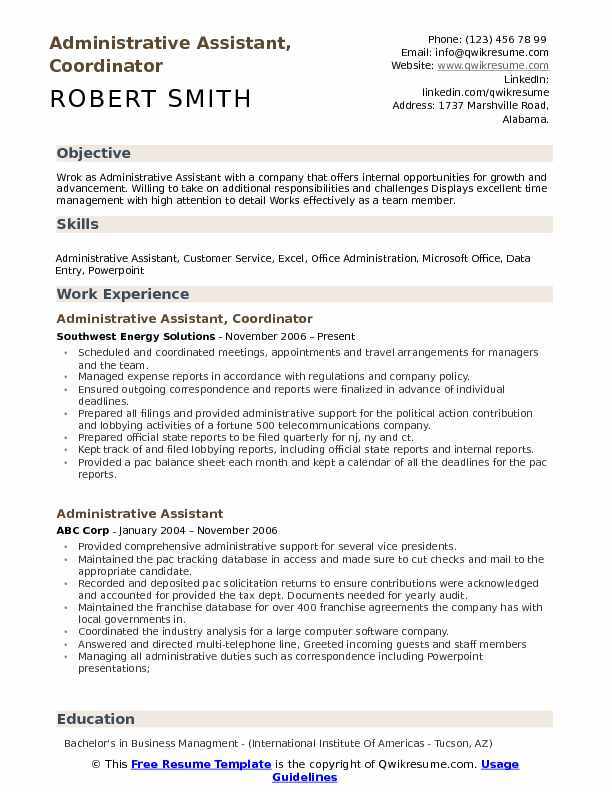 Summary : A professional with a strong administrative and technical background. 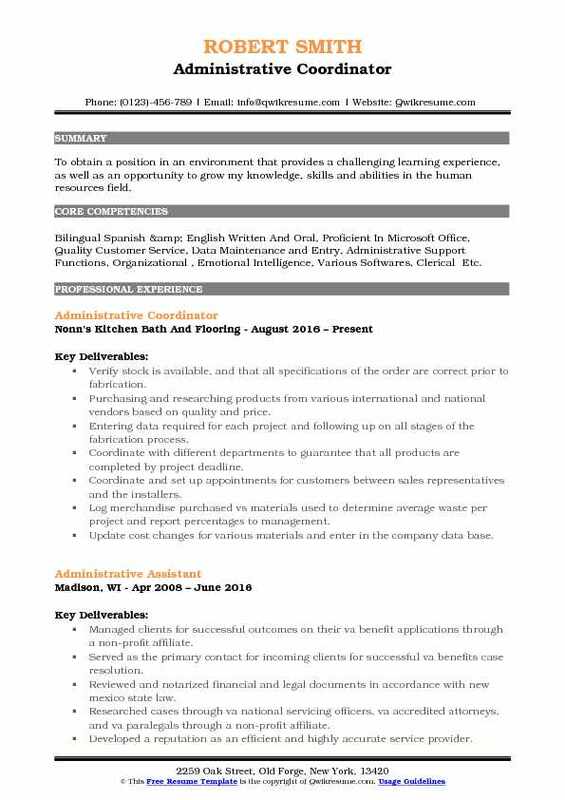 Bilingual English/Spanish Advanced computer skills including Microsoft Office, Windows and Mac Systems. Effective team player who works well with others but can also work independently. Strong organizational skills which enable me to get projects done efficiently. Provides support for the office of distance learning initiatives specializing in administrative and faculty support and web and social media design/modification. Organizes quality assurance peer review teams for kctcs online learn on demand competency-based courses. Implements payment process for course reviews and works with human resource and payroll departments at colleges to schedule payments. Monitor and organize course development schedules and statuses. Provides administrative & instructional design support for distance learning initiatives. Creates blackboard, peoplesoft, & microsoft office training documents / help guides for the learn on demand project team leaders and the learn by term peer team and distance learning staff. Strategized, executed display of & maintains 150+ program advising guides for kctcs online. Has cross-functional knowledge and skills of all positions in distance learning initiatives department. Prepares and provides all necessities for meetings, conferences & workshops. Monitors, tracks & categorizes documentation for kctcs online budget & direct2degree and created & updates kctcs online learn on demand department budget spreadsheet to track revenue from enrollments. Assists with & files all kctcs online learn on demand & learn by term contracts & agreements. Distance learning staff, distance learning peer team & learn on demand project team support. Preparation of the kctcs online learn by term and learn on demand update letters annually for sacs meeting the terms of kctcs online sacs requirements. Create/ modify/ edit files, prepare thepoint, peoplesoft & dss reports, prepare excel spreadsheets, create email distribution lists for easily accessible & accurate data. Site owner / administrator of all kctcs online learn by term and learn on demand sharepoint & sitecore pages to ensure they stay current and organized. Administrator of the kctcs online facebook page. Summary : Skilled Administrative Assistant with extensive experience at leading corporations supporting all levels of executive management. Excellent communication, organizational and computer skills. Front line communication between teaching staff, administrators and students. Follow the rules of our accreditation and keep the standards of VAWA and other federal regulations. Keep impeccable records of daily financial transactions, student documents, and client files. Balance end of day financials, prepare deposits. Train new office employees, facilitate meeting with office staff. Keep clear and consistent records, track inventory, and do weekly order. Create databases using Excel, Fiilemaker Pro and Quickbooks as needed. 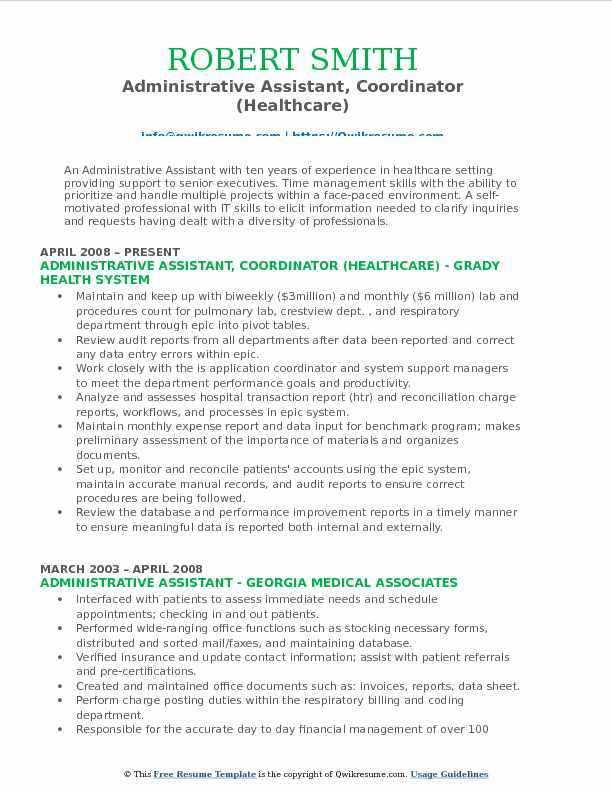 Summary : An Administrative Assistant with ten years of experience in healthcare setting providing support to senior executives. Time management skills with the ability to prioritize and handle multiple projects within a face-paced environment. A self-motivated professional with IT skills to elicit information needed to clarify inquiries and requests having dealt with a diversity of professionals. 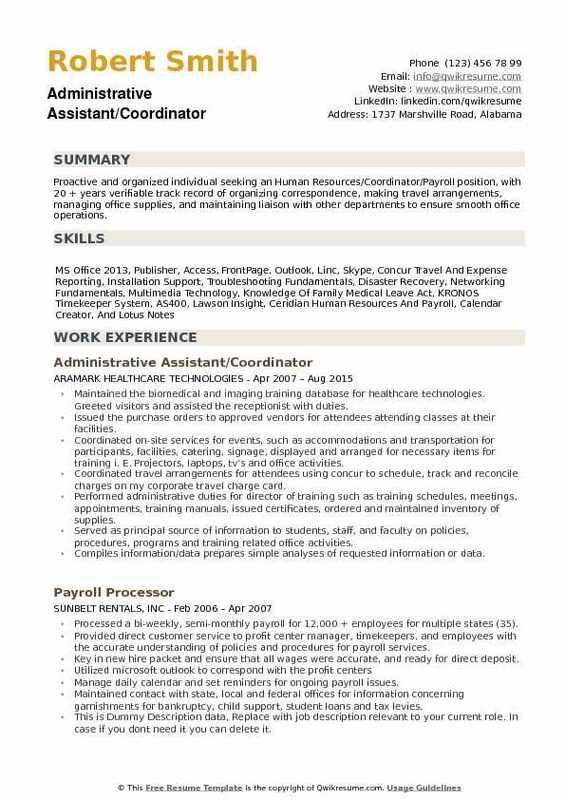 Skills : EPIC, EMR (Electric Medical Records), MS Office Suite 2010 (Word, Power Point, Outlook), PeopleSoft (Procurement), QuickBooks. Maintain and keep up with biweekly ($3million) and monthly ($6 million) lab and procedures count for pulmonary lab, crestview dept. , and respiratory department through epic into pivot tables. Review audit reports from all departments after data been reported and correct any data entry errors within epic. Work closely with the is application coordinator and system support managers to meet the department performance goals and productivity. Analyze and assesses hospital transaction report (htr) and reconciliation charge reports, workflows, and processes in epic system. Maintain monthly expense report and data input for benchmark program; makes preliminary assessment of the importance of materials and organizes documents. Set up, monitor and reconcile patients' accounts using the epic system, maintain accurate manual records, and audit reports to ensure correct procedures are being followed. Review the database and performance improvement reports in a timely manner to ensure meaningful data is reported both internal and externally. Summary : To obtain a position in an environment that provides a challenging learning experience, as well as an opportunity to grow my knowledge, skills and abilities in the human resources field. 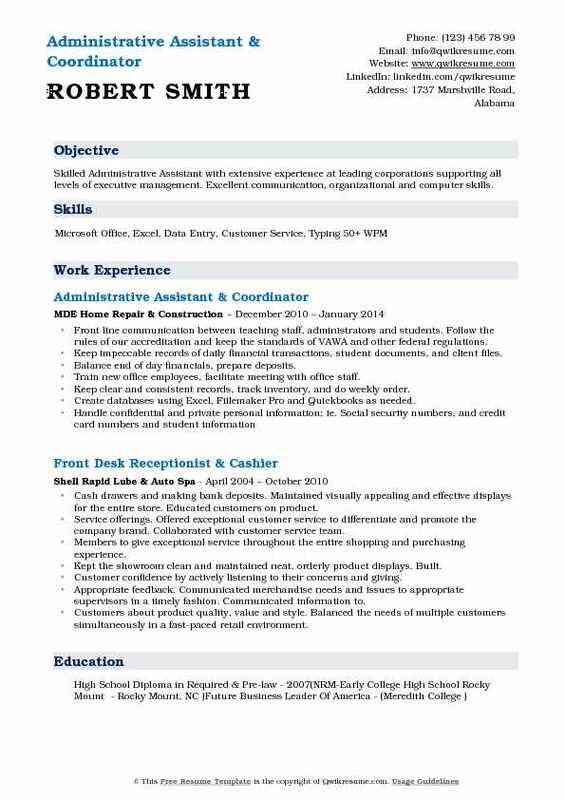 Skills : Bilingual Spanish & English Written And Oral, Proficient In Microsoft Office, Quality Customer Service, Data Maintenance and Entry, Administrative Support Functions, Organizational , Emotional Intelligence, Various Softwares, Clerical Etc. Verify stock is available, and that all specifications of the order are correct prior to fabrication. Purchasing and researching products from various international and national vendors based on quality and price. Entering data required for each project and following up on all stages of the fabrication process. Coordinate with different departments to guarantee that all products are completed by project deadline. Coordinate and set up appointments for customers between sales representatives and the installers. Log merchandise purchased vs materials used to determine average waste per project and report percentages to management. Update cost changes for various materials and enter in the company data base. Summary : Dedicated and focused Administrative Assistant who excels at prioritizing, completing multiple tasks simultaneously and following through to achieve project goals; seeking a role of increased responsibility and authority. Wrote reports and correspondence from dictation and handwritten notes for speech pathologist and clinic director. Responsible for scheduling, rescheduling, and confirming appointments for clinic director and clinicians. Reconciling billing statements, assisting in filing documents and balancing account statements, processing vendor payments and maintenance of vendor files, and other general data entry. Summary : Proactive and organized individual seeking an Human Resources/Coordinator/Payroll position, with 20 + years verifiable track record of organizing correspondence, making travel arrangements, managing office supplies, and maintaining liaison with other departments to ensure smooth office operations. Maintained the biomedical and imaging training database for healthcare technologies. Greeted visitors and assisted the receptionist with duties. Issued the purchase orders to approved vendors for attendees attending classes at their facilities. Coordinated on-site services for events, such as accommodations and transportation for participants, facilities, catering, signage, displayed and arranged for necessary items for training i. E. Projectors, laptops, tv's and office activities. Coordinated travel arrangements for attendees using concur to schedule, track and reconcile charges on my corporate travel charge card. Performed administrative duties for director of training such as training schedules, meetings, appointments, training manuals, issued certificates, ordered and maintained inventory of supplies. Served as principal source of information to students, staff, and faculty on policies, procedures, programs and training related office activities. Compiles information/data prepares simple analyses of requested information or data.